Recently, we lost out on a job because a low-bid roofer came in, undersold the project and pulled off what I would consider the ultimate bait-and-switch roofing job in 2013! In the case of this particular project, the customer's warranty from the roofing manufacturer is worthless. The client was sold a particular manufacturer's product, yet the roofing contractor installed something entirely different. To make it even worse, they were provided with a warranty from a third manufacturer who's products were not even used on this project! And last but not least, the contractor installed a standard modified torch roofing product when this conditioned, commercial building should have had a Title 24 compliant cool roof installed per the local city and California building requirements. This project was not huge, nor did it make or break the tremendous year we had in 2013. Sadly though, this happens every day in the roofing industry and customers spend thousands of dollars on a roofing project that ultimately is worthless. Our company sees this time and time again, with unscrupulous roofing contractors underbidding work and misleading clients, only to leave the client hanging when their roof begins to fail and leaks begin to happen in the middle of the night during that winter storm. We've written in a past blog post, "I Can Install That Roof Too... For Less! ", about what clients should be looking for and asking when collecting multiple bids for their roofing project, but in this post, we're going to show you what to look for after you've signed the project with a roofing contractor. 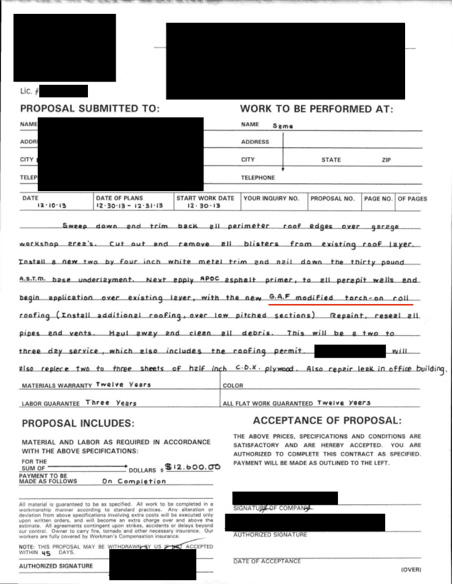 Let's use the above referenced project as an example and analyze the bait-and-switch tactics that these roofers used. In an effort to keep it professional, we have elected to black out the contractors name in this case, though we have no problem with screaming from the mountain tops and calling out hack roofers who mislead and place a black eye on the professional roofers in our industry. 1) Start With The Contract- We won't get into the details about this guys contract which are totally against what the Contractor State License Board (CSLB) requires of a contractor. Let's just simply focus in on the low-slope commercial roofing system that this contractor specified. In this case, they called out for a "G.A.F. modified torch-on roll roofing." They are calling out for a recover, when we called out for complete tear-off and this client had longterm leaks and visible signs of deck damage. There is no description of which modified material the roofer intends to use other than manufacturers name and the contractor in this case is not a certified GAF installer. Interestingly they called out for a GAF product at the clients request because we went into detail with the client about this particular manufacturer and roofing system for their application and budget. Again, we could poke holes in this contractors specification of work and contract, but for the sake of this post, we're keeping it simple and to the point. 2) Ensure The Products Being Installed Match Your Contract- The client in this case was wise enough to take pictures of the materials and work being performed. Ironically, though he didn't know it at the time, he caught this contractor pulling off the ultimate bait-and-switch. 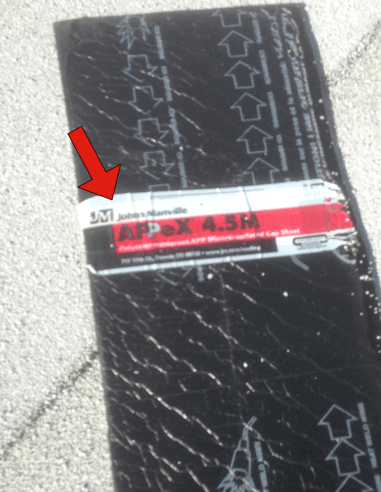 Instead of installing the contracted GAF modified torch roofing system (which by California State and local city guidelines should have been a Title 24 compliant cool roof material for this building) the contractor installed a standard APP modified Johns Mansville torch material. Now, no offense to Johns Mansville's product, they're a solid manufacturer in the industry and put out great products. However, you can see the serious problem here, correct? The customer was sold in a signed contract one thing, then the contractor installed something completely different without notifying the customer of any change in specification. Not only is this unethical, it is illegal. The sad thing is this happens every day in our industry and though we face it routinely, we usually don't get a chance to highlight it with this level of detail because the average customer is naive enough for a black market contractor to pull this off. For any contractor who is worth a grain of salt and plans on being in business long enough to back and support their workmanship, knows practices like this are completely unacceptable. This is one step toward practicing what we like to call "Going out of business!" 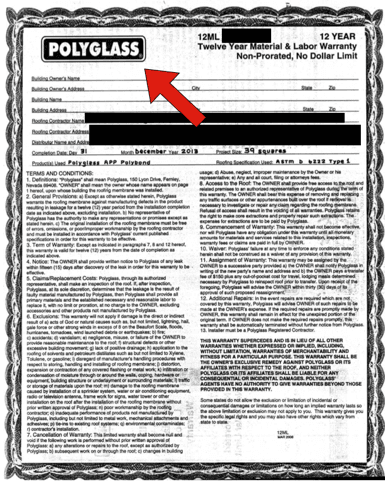 3) After Your Roof Is Installed, Request Warranty Information For Your Files- Pertaining to this project, the client requested warranty information from the contractor and the below picture is what they got. Low and behold, they received a No-Dollar-Limit warranty certificate from Polyglass. Yes folks, a completely different manufacturer from what they were sold in their contract and even different from what was actually installed! So in this case, this contractor has not only exposed themselves to liability, but they have provided the customer a worthless warranty and now exposed manufacturers to potential liabilities and headaches. This is not an uncommon occurrence in our industry and it's why we work diligently to inform and educate our customers. The example above is a perfect example of why and how a black-market roofing contractor successfully gets away with putting out a low bid.  We want consumers to be informed and more educated about the roofing process. It's why we train our team constantly on the most current and recent roofing systems in the industry. It's why we are an active part of national trade organizations such as the NRCA. And it's why we actively work with the CSLB and local municipalities to shut down these quack roofers. Please folks, know that you pay for what you get. There is a reason why a roofer is significantly less expensive than your other bids and more often than not, it's because he's cutting corners somewhere and in the end you'll pay for it somewhere. Please, take the time to forward this post to your friend, family member or co-worker who may be thinking about getting a new roof installed. It may just save them a great deal of headache and money.